Don't think anyone can be surprised as to the results of the cycle superhighway survey. Wonder where all this will go from here? Thanks for posting this info up. Mentioned it on Twitter. The only good thing about the bike hire scheme is putting cycling back on the map. It's such a breath of fresh air to see people cycling in normal clothes - such a contrast to lycra clad warriors you mostly see. Plus there is a psychological factor - it makes the bicycle cool again. Obviously it must not be the end - while the hype lasts more should be done about the infrastructure, but where I generally see the CSs as a failure the bike hire scheme is a success in many ways. Re: "Almost half of all users would otherwise use their own bikes. 84% of registered users of the scheme own their own bike." Note that this is 84% of registered users who responded to the survey. The survey reached a tiny fraction of registered users and it was plugged a lot on bike blogs and websites, so this number might not be representative of the scheme in general. The hire scheme and blue paint have only been going four months. It's too early to say it's a failure. In fact I find it encouraging that half the cycle hire users did not previously cycle in London (survey of self-selecting users). It seems reasonable to assume that as time wears on, more and more so-called non-cyclists will try the scheme and cycling will become more socially accepted as a normal thing to do. David, sometimes I think you don't appreciate the difference between going from 0 to 1% bicycle mode share on the one hand, and going from 3% to 30% on the other. To get from 0 to 1% you need to win hearts and minds, but you dismiss this key issue as "hype". The nuts-and-bolts issues you discuss on your blog apply when moving from 3% to 30%. Have you tried one of the bike hire schemes? They're fun. You can combine public transport, walking and biking all in one trip. It's like having a folding bike which actually does fit in your pocket. Erik: It's a summary of the progress so far, as reported by the officials in charge. A failure ? I didn't say that. Nor did the people who wrote the report. However, the schemes have not met their targets, and the change in modal share is 0.01%. Do you count that as a success ? The claim in the report is that 1/5th of users of the cycle hire scheme are new cyclists, not a half. Like you, I expect that it will slowly pick up users. But that's the problem. It can only happen slowly and is limited in potential because the capacity isn't there to carry more than a very small percentage of the total traffic in the city. And you wonder why I say it's been hyped ? London could simply have built the infrastructure and put in the hire bikes on the quiet to see what would happen. They could also have done so with a little local publicity targeted at likely users. However, what they actually did was send press releases around the world about how amazing it was all going to be. As I pointed out below the article above, the Dutch papers actually took them seriously. So did lots of people the world over. They also didn't need to tell everyone that it was about to to break even financially, when it so obviously will not. That is hype. There's no other word for it. They've spent a lot of money on the amazingly expensive bikes, a lot on the not very good cycle lanes, and also a lot on hype. The reality doesn't live up to the hype. I'm sure you're right that bike hire schemes are "fun". However, so are many other things which are a lot less expensive. So what has happened ? Well, it's rather disappointing. The largest amount of money ever spent on cycling in the UK has been spent on schemes which have not made a significant difference. I have an emotional affinity for bike sharing schemes; however, I don't believe that they have much chance of accomplishing what they intend. I believe that spending the same amount of money on realistic and safe cycling infrastructure would, over time, be much more effective in moving people from vehicles to bikes. It appears to me that the bike share is a service to the 1% Fearless and 7% Confident groups. They can 'outsource' the risk of their own bike getting stolen or damaged to the bikeshare. Until the streets are made safer this seems to be the main service the bikeshare provides. Transporting people is just a side effect. It will be interesting to see what happens once the share opens to casual users. Will there be locals trying it out and then buing memberships? Or will they use it just once a while? How much will the ridership increase? Will the tourists get in a lot of accidents because they have to ride on traffic where everyone is on the wrong side of the road? "London just could not have Paris being one up on London." And after all these centuries you'd think they'd be used to it by now. It's the lure of the quick-fix. People who have a weight problem will go sooner for the expensive miracle slimming tablets or even more expensive liposuction than change their lifestyle, even thought they somehow know, in the back of their heads, that the 'quick fixes' of this world either don't work or work for a short time only. Governments ought to be wiser than fall for and peddling the showy quick fix.. Wait! What am I saying?! Govenments *adore* the quick fix! That way the punters can be shown that You Care enough to try to solve their problems whilst leaving the inevitable breakdown for the Other Party to clean up, after the next election. Strict Liability seems to have become a rather popular idea amongst British cyclists recently. In some cases, people claim that this alone would be enough to get people cycling. However, I believe this is false. Changing the legal liability doesn't change how the streets feel. The lack of cycling is not due merely to a worry that their family might not get compensation after they've been crushed by a truck. No, it's worry about being crushed by a truck in the first place. How it works is also somewhat different to what many British cyclists have been told. (you can see a simplified legal document here). In many cases a driver in an incident will not be held 100% liable. That would be quite absurd. Note also that this only came into Dutch law after there was a majority cycling culture. I don't think it's at all realistic to expect it to happen in the opposite order. However, don't worry about that. It's a good thing, yes, but actually only a very small part of the picture. Most Dutch people I've mentioned this to are unaware of the legal difference. There is also no simple phrase (like "strict liabilty" in English) to describe it. It's known as "art. 185 WVW" of the law, and that doesn't exactly roll off the tongue. That's a reflection on how conscious the average Dutch driver and cyclist is of this law. It's not something which comes to the forefront of every driver's mind each time he sees a cyclist and Dutch cyclists don't reflect on how good it is to have the protection of "art. 185 WVW" before they take to two wheels. Dave, an article came to my attention. It was published in certain Czech news. It references AFP from The Hague. According to it Dutch cycle path are more and more congested and dangerous. They quote Hugo van der Steenhoven saying that "We became victims of our success" (in translation). Also, that sometimes there are so many cyclists at traffic lights, that not all of them manage to get through during the same light cycle. Supposedly, 1.75 million people bike between 8 and 9 o'clock in the morning. Also, the article says that the situation is made worse by the increase of motorized bikes on the bike paths. Michael Blue: Yes, sometimes there are a lot of cyclists. Yes, sometimes this can cause a little congestion. However, it's nothing like the results of car congestion, and "dangerous" is a strong word. Dutch cyclists remain the safest in the world. I can't remember ever failing to get through a traffic light junction on the first green that I saw. Waiting times tend to be quite short for cyclists (see the videos). The population is about 16 million, and 27% of all journeys are made by bike. That equates to about 10.5 million journeys every day by bike (16 million * 2.5 journeys each per day * 0.27 = 10.8 million), so 1.75 million people on their bikes between 8 am and 9 am doesn't sound high at all. Motor assisted bikes are hardly seen at all in the rush hour, as was discussed in the comments a couple of weeks ago. Can we stop going on about the Dutch! Holland is pan flat and as a nation cycling has been part of their lifestyle for over a century. I have been cycling many thousands of miles for over 30 years across the UK - and it is not flat! I have also commuted in London for 15 years and think the introduction of the cycle scheme is a fantastic idea - seeing so many people on the little blue bikes during the day is a revelation. Just give it time and stop being so negative. No one could properly forecast the take up of such a scheme so to criticise it on the basis of failed targets sounds political to me. Simon B: Where would you prefer that we "go on about" ? Many excuses are made but the truth is that no real progress is being made. I wish it were not so. Britain could do a lot worse than follow the Dutch example. Hopefully the hire bikes will become more popular now they are open for casual use, although there have been some technical problems. Road schemes all do have to cover their costs. I doubt a road scheme in the UK without a positive bcr has been built since 1960. The same is not true for rail or cycle schemes that are regularly built without a decent bcr. It is a shame that the hire scheme is failing to meet its targets but then cycle schemes in the UK regularly do - hence the reluctance to invest in them. Bike share needs to be an expected mobility utility in the larger towns and cities in the developing world -- expected like pay phones/mobile networks, water fountains, bathrooms and so on. To get to this level of normalcy it needs to stop being treated as a special case which requires no subsidies or that it should make money. In other words it should just be treated as collective public transport, which gets funding from different sources. And of course it should be implemented efficiently within a seamless mobility system. Ideally, bike share also gives people what an owned bike does: Getting from an A that is a close as possible to your real starting point to a B that is just as close as you would park your own bike. In other words, not the current 3rd Generation system, but something truly customer focused and perhaps even better than an owned bike in terms of functionality in some respects -- this seems necessary if investment is substantial (Commenter is part of the OPENbike team). Green Idea Factory: You make money from bike share schemes. Of course you're positive ! However, the number are still nothing much. The article you link to says that New York wants a 10000 bike scheme. It sounds so impressive. Such a big number. However, New York has 20 million residents, so it's actually only one bike per 2000 people. That's less impressive than London's one bike per 1300 people. It's even less impressive than the "more than sixty" OV-Fietsen at Assen's railway station, as they're closer to one per thousand residents. However, there's one important difference. Hardly anyone outside of the Netherlands has ever heard of OV-Fiets, the national cycle share scheme which is available all across the Netherlands, because the Dutch aren't hyping it as something that it is not. It's not the be-all-and-end-all of cycling, but just one small element of many which make the Netherlands the leader in cycling. the Tube (20 per cent)." I think that's a very fine result. Cycle hire is freeing up seats on public transport, making public transport a more attractive alternative for longer journeys. On page 13 it says "TfL now expects to break even on operating costs within two to three years." That's better than just about any conventional public transport system anywhere. They never break even. The reason London needed a cycle hire is because Paris has one, and the reason they are no good is that Assen doesn't have one. Erik: You really do seem to want an argument today. Yes, I've read that paragraph. I just read it again. It still does not support your previous comment: "I find it encouraging that half the cycle hire users did not previously cycle in London". 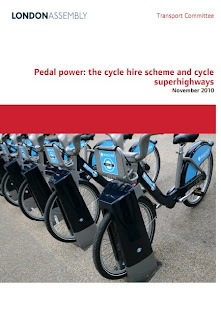 Flip back to page 11 and you'll read that "Around one-fifth of respondents had started cycling as a result of the cycle hire scheme". i.e. 80% of respondents already cycled in London. What they then tell us in the paragraph which you quoted is that they've achieved a fifth of the switch originally expected from cars, a fifth of that expected from walking and a quarter of that expected from buses. It's surprising given the other figures, but happily the numbers of people switching from the tube are right on target. However, people switching from these other modes together only account for 36% of usage, not the expected 91% (I can't explain why their percentages didn't add up to 100%, perhaps the other 9% were expected to be cyclists?). We can see from this that quite a considerable part of current usage is by existing cyclists (80% of respondents), and also that quite a lot of usage is by these existing cyclists switching from using their own bikes to using the hire bikes. That's not necessarily a bad thing in itself. However, it's certainly not what was hoped for from the scheme. And "breaking even" ? Again you're selectively quoting. This is what was reported by David Brown in October. Go and read it again, and this time continue to the next paragraph: "Since then, TfL has reported that, in the first four months of the scheme, it has achieved £1.9 million of income from charges. This is just 10 per cent of the amount it expects to generate from charges by March 2011 (£18.7 million). It is, therefore, expecting to generate the majority of the income this year in the next four months following the roll-out to casual users. However, this coincides with the winter period when demand is expected to fall and therefore these income expectations seem optimistic." Do I need to say more ? These are the words of the reports authors, not mine. I'd be very happy to see the scheme break even. But as it stands, it will not do so in any great hurry. I agree with you that an expectation for such a system to break even ever is rather odd given that the same standards are not applied to other things. And I said so in the original article above. Now your next daft comment: "the reason they are no good is that Assen doesn't have one." You're wrong about this too. Assen does have bike-share: There are OV-Fiets bike share bikes here at the railway station. The numbers aren't huge, at "more than 60", but because the population is just 65000 this city has a shared bike for every 1100 people in the city vs. only one per 1300 people in London. There's one reason why I don't write about Assen's bike share, or OV-Fiets in general (it's a national scheme, in every city in the country) as being a huge success which is transforming cycling here. The reason is that it would be a lie to say that this was the case. This is just one very small part of the overall picture. In both Assen and London the bikes are in such small numbers that they can't really have much of an effect on modal share. OV-Fiets, like other bike share schemes, is convenient for a few people. That's great. That's all it needs to be. No hype required. Yes 80% previously "cycled in London" but we don't know how often or for which journeys. The report says "Over half used the hire bikes instead of different modes". So the cycle hire has encouraged cyclists, ie people who cycle on occasion, to use bicycles for journeys where they previously would have used other modes. That's success. Others have taken up cycling in London purely because of the cycle hire. When the service is opened to casual users, modal shift is likely to rise. Great. They even aim to break even in a few years. It's a matter of when, not if. Again, great. What other public transport system does that? As for OV-Fiets, it is experiencing dramatic growth. 100 000 journeys in 2004, 670 000 journeys in 2009. According to my notes, they aim for one million nationally by 2011. So there's room for exciting, successful cycle hire projects even in the Netherlands. OV-Fiets doubled the number of journeys from 2007 to 2009. This shows that cycle hire can grow cycling in ways that cycle paths can't. It's easy to use together with public transport and you don't need to worry about theft. If it works in the Netherlands, surely it's exciting to see it work in London too. Erik: The number of cyclists added to the streets by the cycle hire scheme in London is currently absolutely tiny. Even if it meets its promoters expectations it will still be absolutely tiny. That's the problem with bike-share schemes. The only thing that is large about them is the hype. The promoters, like yourself, have plenty of big impressive sounding numbers to shout at people, but actually very little, if anything, to show for all the hype. I find it extremely sad that you try to take people in with this nonsense. You don't seem to comprehend what you're looking at. NL is a country with 16 million people who between them already make around 13.5 million cycle journeys every day. That's nearly 5 billion journeys per year. It is great that OV-Fiets is growing, and I'll be pleased if it reaches a million uses per year. However, this will account for just 0.02% of the total cycle usage in the country. Between 2007 and 2009 the doubling that you talk about was actually a difference of about 0.005% of the number of cycle journeys. That's a number which is so small that you couldn't possibly measure it in the overall picture of cycling in this country. Let's inject some reality into the rest of your last rather excited paragraph: OV-Fiets "can grow cycling in ways that cycle paths can't", by a factor of 0.02%. It will be "easy to use together with public transport" for 0.02% of cycle journeys, "and you don't need to worry about theft" for 0.02% of cycle journeys. "If it works in the Netherlands, surely it's exciting to see it work in London too." Yes indeed. As I've shown before, the potential of the system in London is perhaps for 0.03% of journeys. That's, er, 50% better than the Netherlands ! Amazing ! Now I'm as excited as you are ! Actually, amongst the best things about the OV-Fiets system is that they're realists and not hyping it as something that it's not. Well, normally this doesn't happen. You seem to have chosen role today. Please, before any more silly comments like this, get a sense of proportion. David, as you write on your blog, joining up bicycling with public transportation is a big deal. The share of train passengers arriving by bicycle has increased from 30 to 40 per cent in the past ten years in The Netherlands. As you note, it's hard to take a bike on the train during rush hour so having another bicycle waiting for you at the other end of a train ride is very clever. This is why OV-Fiets is growing quickly. It will likely continue growing (past the one million mark 2011) until people cycle from the train almost as much as they cycle to it. It is likely also a factor for Vélib and Boris Bikes. The potential is large in London and Paris because so many journeys there are done with public transport. You're right that the growth is from a low level, but you need to start somewhere. I don't normally cycle within inner London, but during the SkyRide I was able to talk to a woman on a Boris bike. She said they were slow, but she'd had three bikes stolen in three years. Including one outside her work that was covered by CCTV and her expensive bike stolen along with her partner's bike from outside their flat on the only occasion her bike had been left outside overnight secured with approved locks to an immovable object behind a 7 foot / 2.1 metre security fence. She was clearly frustrated by the thefts. Overall she saw the Boris bikes as a good thing, primarily because of the thefts. At the time, I no idea how expensive the Boris bikes 'package' made each bike and I'm pretty certain she didn't either. Like yourself and others, I can't help thinking that all that money could have been much better spent on really safe and practical cycling facilities. Here in Toronto, we have a bike share system downtown (Bixi, same as the one in London) and it is generally considered to be a success. The intention was never that bicycle sharing would make up a large percentage of trips. The main intention was to make cycling more widespread by giving bikeless visitors (mainly suburban residents, visitors from other cities, and tourists) access to bicycles downtown. Suburban residents are notable because they are the ones who typically oppose bicycle infrastructure projects. Giving them first-hand experience using a bike for transport could change their opinions. Bike share also makes cycling more practical for those in small apartments with poor bike parking facilities. I expect that parking is the second reason (after the subway) that Toronto's central business district only has a 2-5% cycle commute rate, while the medium-density areas just outside have 10-17% cycle commute rates. I have used the bike share system myself, even though I own two bicycles. The reason is that it is nearly impossible to cycle from my house in the suburbs to downtown, while the subway is an extremely effective way of getting there. The bike share gives me (and thousands of others like me) great mobility once I do get downtown. Of the 5.4 million people in the Toronto area, only 600 000 actually live in the downtown area. Cycling downtown is not a viable option for most people (lack of infrastructure, distance...) but taking the train certainly is. The bike share is intended to be a catalyst for change, not a direct cause. By all means, call out when people claim it will single-handedly create huge cycling numbers, but don't diminish the benefits it does provide. By the way, our bike share system is self-sufficient, except for a startup loan from the city. So by no means is it a waste of money.